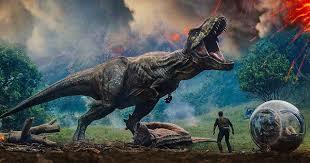 Show Me The Movies: Review: Jurassic World: Fallen Kingdom - A non-stop visual rollercoaster that will thrill big budget blockbuster fans! Review: Jurassic World: Fallen Kingdom - A non-stop visual rollercoaster that will thrill big budget blockbuster fans! Following on from the highly successful 2015 reboot Jurassic World comes the highly anticipated sequel Jurassic World: Fallen Kingdom. With Colin Trevorrow and Derek Connolly again on writing duties and the return of the ever charismatic Chris Pratt and Bryce Dallas Howard as well as the addition of a very talented director in the shape of J.A Bayona (whose previous productions includes A Monster Calls and The Impossible), this big budget box office adventure was bound to contain the same vital ingredients that made the first feature such a colossal hit. Matching the originality and freshness of Jurassic World was going to be another challenge completely however. Jurassic World: Fallen Kingdom takes place three years after the destruction of the Jurassic World theme park, and sees Owen Grady (Chris Pratt) and Claire Dearing(Bryce Dallas Howard) return to the island of Isla Nublar to save the remaining dinosaurs from a volcano that's about to erupt. They soon encounter terrifying new breeds of gigantic dinos while uncovering a conspiracy that threatens the entire planet. Regular cinema goers would have seen a glut of trailers for this monstrous adventure feature in the months leading up to it's release and before taking their comfy cinema seat at Tralee Omniplex would have had a vague idea of the scares, thrills and awesome visual effects coming their way. Those trailers, however do not do justice to what is visually unlike anything you will experience on the big screen this year. Almost playing like a 4D experience the special effects are simply jaw dropping and will thrill and frighten in equal measure and this ocular rollercoaster is one that needs the big screen experience (IMAXX if possible) to be really appreciated for what it is - a big budget popcorn summer blockbuster that bombards the senses. Of course, like most big budget blockbusters there are the inevitable pitfalls - it takes at least thirty minutes before the film ignites and it is a bit clunky at times. Rafe Spall too hams up his role as the villain of the piece but all these drawbacks tend to be common to the big budget blockbuster and this feature should be enjoyed for what it really is - a non-stop visual rollercoaster that will thrill it's audience.